The Crystal Geyser water bottling plant along Highway 395 is viewed on April 4, 2017, in Olancha, California. 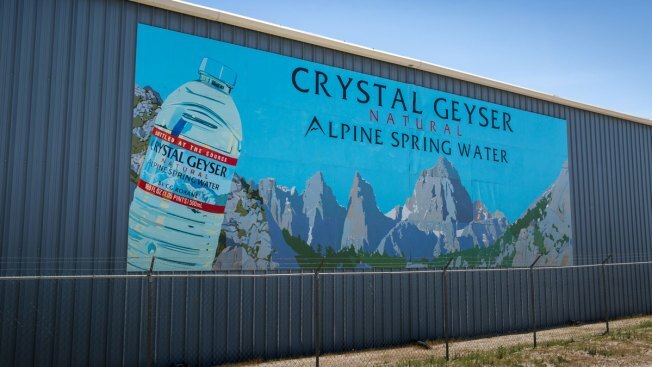 The California company that sells Crystal Geyser bottled water has been charged with illegally disposing of arsenic-tainted wastewater, federal prosecutors said Thursday. The charges don't allege that CG Roxane LLC sold tainted water, but that it illegally shipped and disposed of the toxic waste filtered from well water. A 16-count indictment in Los Angeles federal court alleged that Crystal Geyser and two other companies failed to properly disclose the toxic material they shipped in May 2015 and disposed of at a facility not permitted to treat hazardous waste. "Our nation's environmental laws are specifically designed to ensure that hazardous wastes are properly handled from beginning to end," U.S. Attorney Nick Hanna said. "The alleged behavior of the three companies charged in this indictment undermines that important objective and jeopardizes the safety of our community." Phone messages seeking comment was not immediately returned by a CG Roxane spokeswoman. Naturally occurring arsenic was filtered out of water pumped from wells and later discharged in a pond near the company's Olancha facility in the Owens Valley, 160 miles north of Los Angeles. The company stopped dumping the tainted water in the pond after the California Department of Toxic Substances Control found it contained hazardous waste in 2014, the prosecutors said. In May of 2015, the company hired two firms in the Los Angeles area to drain and dispose of the water in the pond. The three companies violated federal law by not disclosing in shipping documents that they were transporting hazardous waste that contained arsenic, the indictment said. Federal law requires that toxic and other hazardous waste be documented from "cradle to grave." The material was taken to a facility in Fontana, about 45 miles east of Los Angeles, that wasn't approved to handle hazardous waste, prosecutors said. If convicted of all counts, each company faces fines up to $8 million.